The Ouroboros is the symbol of eternity, of continuous regeneration, the cyclical nature of time and the oneness and interconnectedness of all life. It is the idea that one being is making him/her/itself manifest via all that is material. 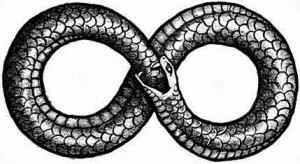 When the essence of this symbol is realized by an individual, he or she is conscious of their connection to all in existence. It is to break away from duality. 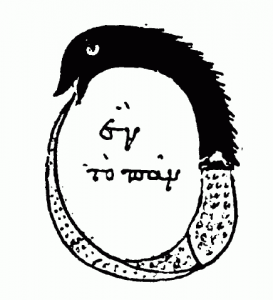 The Oroburus, when it’s meaning is revealed to a person, it takes the shape of the number 8. When it happens to a person it is impossible for them express what it really is. 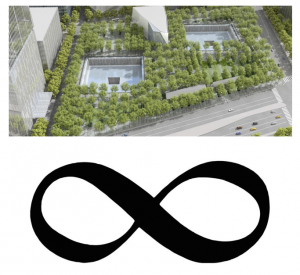 The Official 9/11 Memorial in Lower Manhattan echoes the shape on the number laying sideways; thus symbolic of infinity. On Sept 11, 2001, with 111 days left before the year ended, AA Flight 11 impacted the north tower of a 7-building complex with two towers that side by side resembled the shape of the number 11. Each tower had 110 floors. All of these 1’s anchor this site to the oneness that made itself manifest that day on that site. You can experience this oneness if you visit the Official 911 Memorial and walk along the edges of both pools passing all the names of those who died that day by your visual field. You might feel a connection with your immediate surroundings and to the people who passed on that fateful day that shall never be erased from the memory of time. To live visualizing eternity we need to connect and understand many abstract concepts that in my findings all lead to Jesus Christ. Enhance your understanding by connecting to this work. 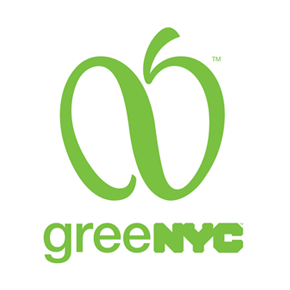 Click here for more info on symbols at the World Trade Center site.